Gemini, an esteemed manufacturer of DJ and Pro Audio gear, kicked off 2012 with two prestigious awards from two celebrated publications. Using this year’s NAMM show as a fitting backdrop, Gemini was presented with the award for DJ Line of the Year from Musical Merchandise Review, as well as the coveted Best New DJ Product Award for the CDJ-700 from Music & Sound Retailer. Gemini captured attention from two of the industry’s most recognized and respected trade publications thanks to their reputation for a diverse, dependable product line and innovative product development. The positive feedback surrounding Gemini’s CDJ-700 also attracted well-deserved consideration, and eventually earned the new professional media player the highly sought DJ product award. Both awards highlight Gemini’s reinvigorated focus on product development and market presence, while maintaining strong relationships with their users and distributors. 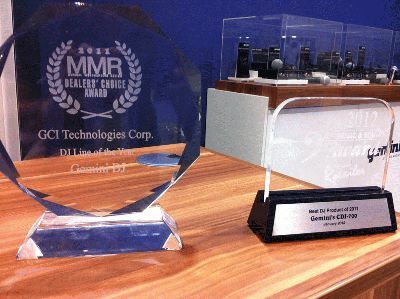 For more information on Gemini’s award-winning CDJ-700, visit geminidj.com/cdj-700. And to view their entire line of DJ and Pro Audio gear, check out geminisound.com.